Confessions of a Para-Normal – My first ghost. I saw my first ghost when I was three years old. Since that time, I have seen several ghosts, some with my eyes and some with my inner eye. This one I saw with my eyes. I was a precocious three year old and I loved to sleep with my parents. They of course preferred me sleeping in my own bed in my room down the hall. The house was fairly small and sat on top of a hill in Los Angeles, California. It has since been torn down and made into a parking lot. Anyway, back to my story. I have no idea what time it was, only that it was night and I had been sleeping for a while. I woke up and saw a woman with dark hair in a white night gown pass by my room carrying something in her hand. I believed it to be a cup. I immediately thought that it was my mother on her way to the kitchen. Remember I said I was precocious. I pictured her making the turn into the living room and straight through to the dining room and then turning into the kitchen. I figured if I went in and got into my parent’s bed while my mother was busy in the kitchen, she would let me stay in their bed with them for the rest of the night. I would pretend that I was asleep when she returned and mom wouldn’t want to wake me. So, I quickly scurried into my parent’s room, only my mother and father were still in bed asleep. I couldn’t understand how this was possible. I woke my mother up and asked her who the woman was who walked into the kitchen? My father immediately got up to see if someone was in the house while my mother let me into the bed with them. My father returned and said no one was there. But I was insistent. I knew I saw a woman walk by my door. I saw her long white gown clearly. I had to be awake because I then came into my parent’s room. My parent’s assured me there was no one in the house. It was important to me that they believed me. I knew I had seen something. I’m not sure how the idea of it being a ghost came up, whether I suggested it or my parents did. My father finally told me it must have been a reflection from the Television set in the house across the street. Now even to a three year old, that excuse sounded lame, especially since our house rose above the one across the street, because we were on a hill. I never forgot that night. I’m not sure if it was because I saw my first ghost, or because I caught my parents in a lie. But I can still see that wavering form walking past my doorway in the hall. My parents were probably freaked out. Not because I had seen a ghost, though they probably worried about their daughter seeing something like that so young. But because the psychic experiences were starting for me so early. Both of my parents have had things happen to them that could only be described as paranormal, but at three years old, I didn’t know that. In fact, I was a teenager and many more things had taken place before they confessed some of their own experiences to me. I hope you enjoyed this confession of the sighting of my first ghost. No, I wasn’t afraid. I didn’t know I should be. To tell the truth, now ghosts kind of scare me. Not always, but I have continued to have experiences with them and not always pleasant ones. I don’t mind interacting with them as long as they are polite and don’t try and take over my life. I really don’t have time to spend dealing with their problems, but an occasional conversation is fine. 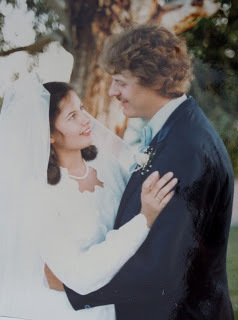 Come over to Vintage Vonnie’s and find out how I met my husband. The story has some funny twists and turns. It also explains why I write about people destined to mate in my paranormal romances.